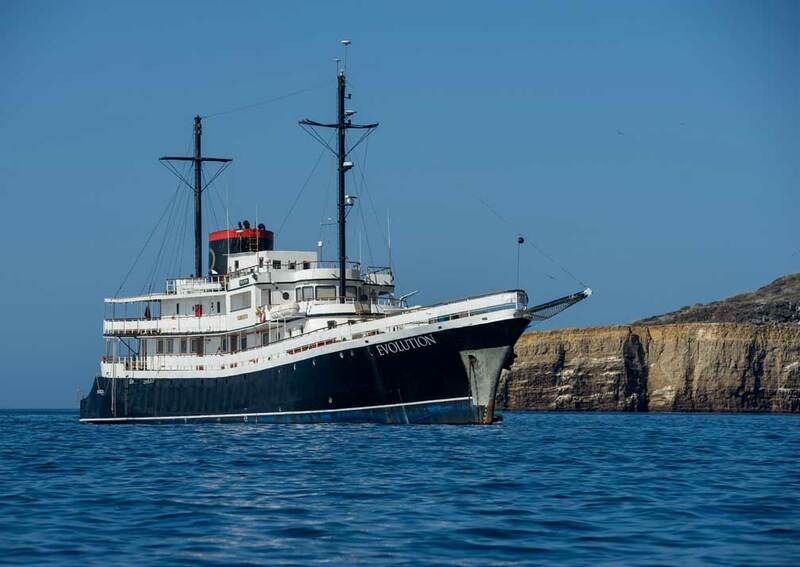 Evolution is an example of classic 1920s yacht design combined with the benefits of modern creature comforts. 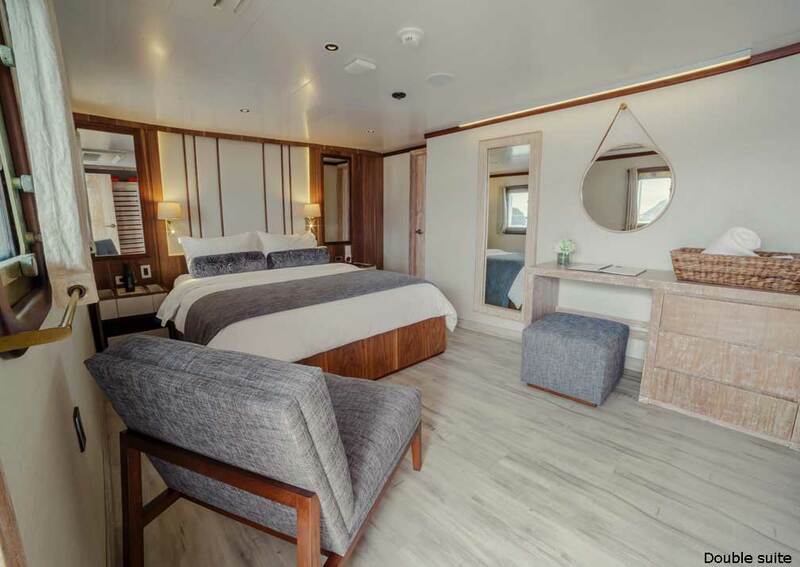 Evolution is an example of classic 1920s yacht design combined with the benefits of modern creature comforts. 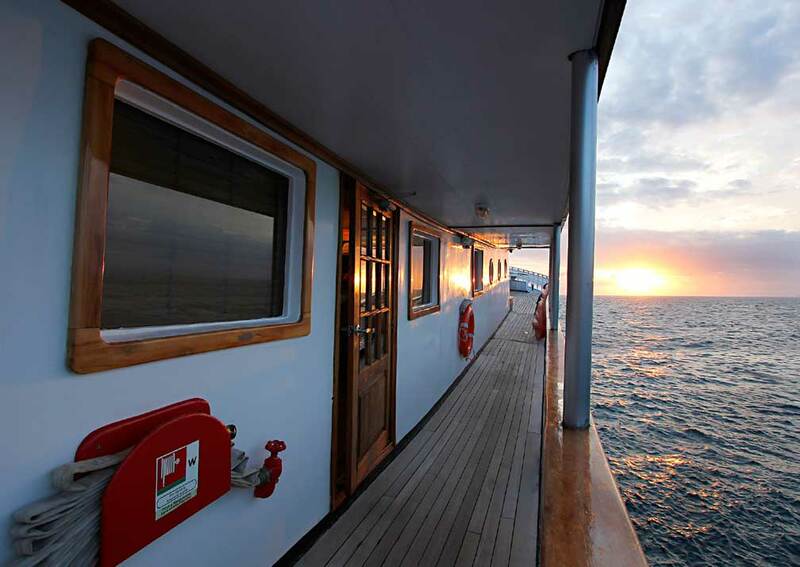 Accommodation is spread over 3 decks and there is ample room to relax. 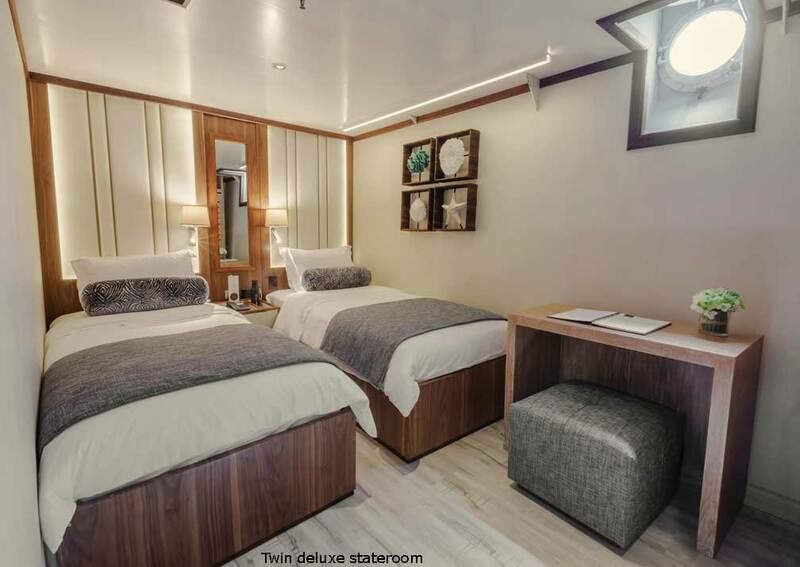 Cabins vary in size and design but all have private bathrooms, climate control, safe and plenty of storage space, so comfort is assured. 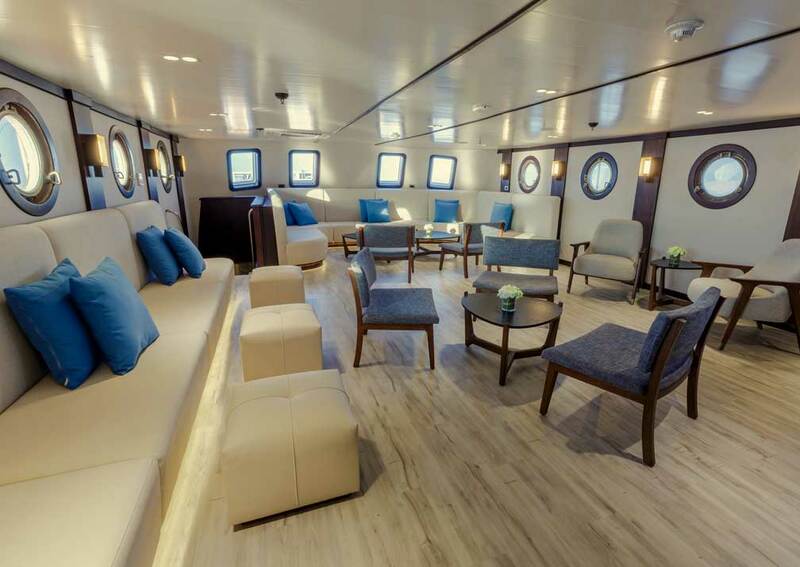 The lounge-bar is the social heart of the boat and this is where the naturalists give talks and presentations about island visits and you can watch DVDs and listen to music. Meals can be taken inside or out, as you choose. They are served buffet style, allowing you to make your own selection of dishes. 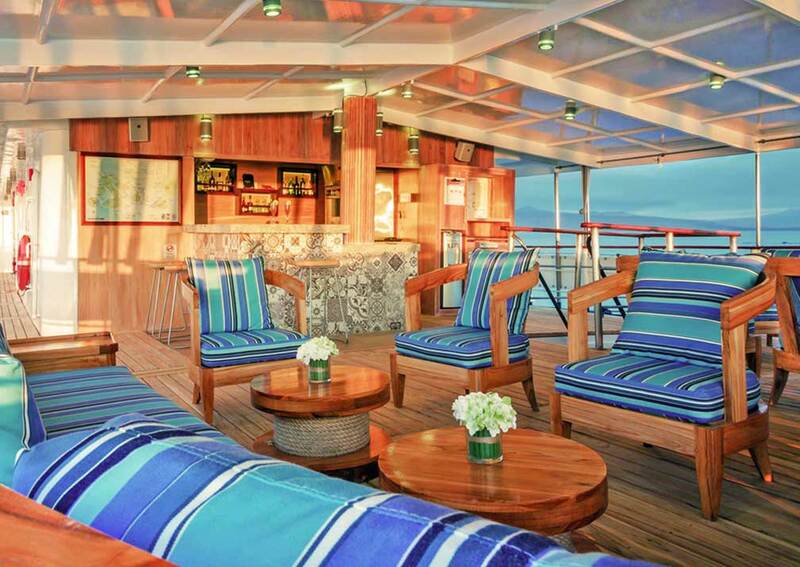 The sky deck lounge is a great place to chill, enjoy a drink from the bar and survey views of the islands. 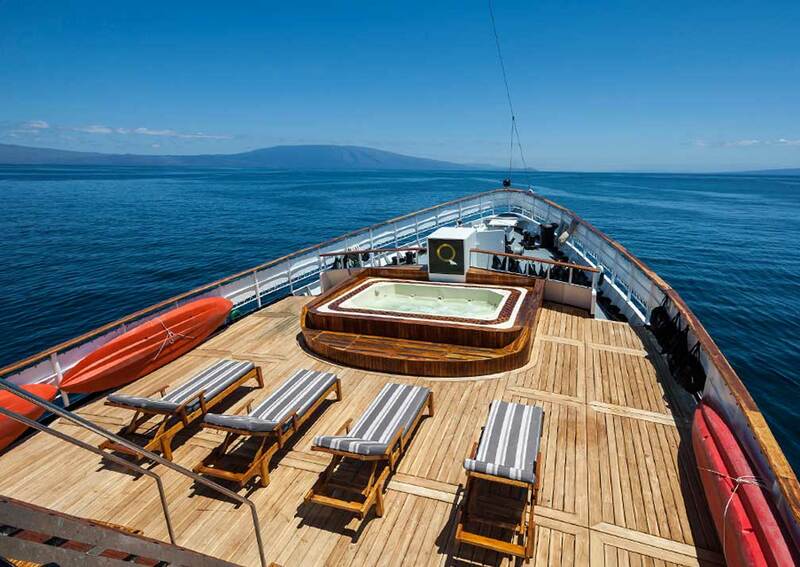 At the bow you’ll find sun loungers and a jacuzzi. 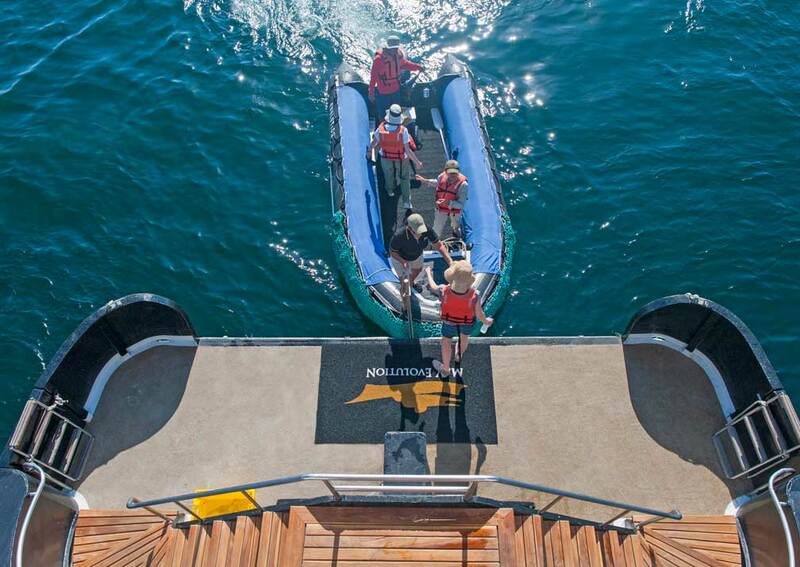 Evolution is equipped with kayaks, wetsuits and snorkelling equipment so you’ll have opportunities to explore for yourself when not on shore excursions. There’s a shop on board where you can buy gifts and souvenirs. 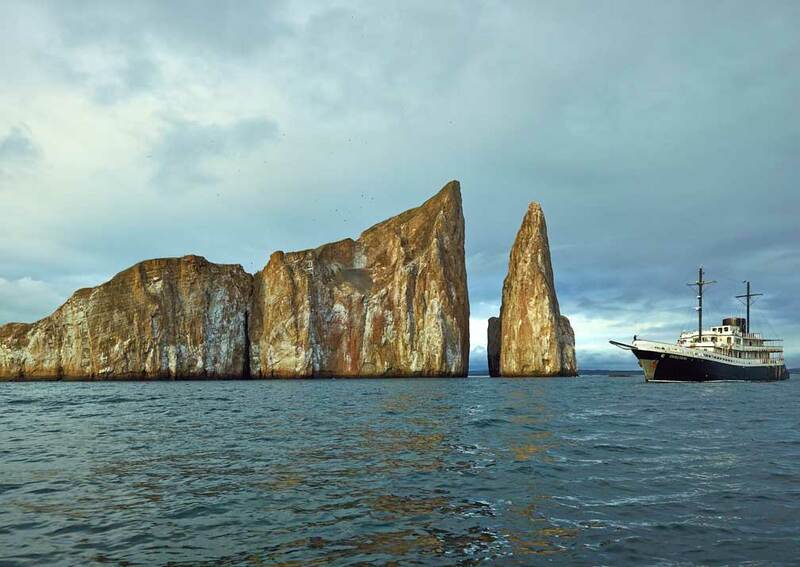 Evolution offers dedicated family cruises with feature a Kid’s Club to keep the young ones busy and entertained. 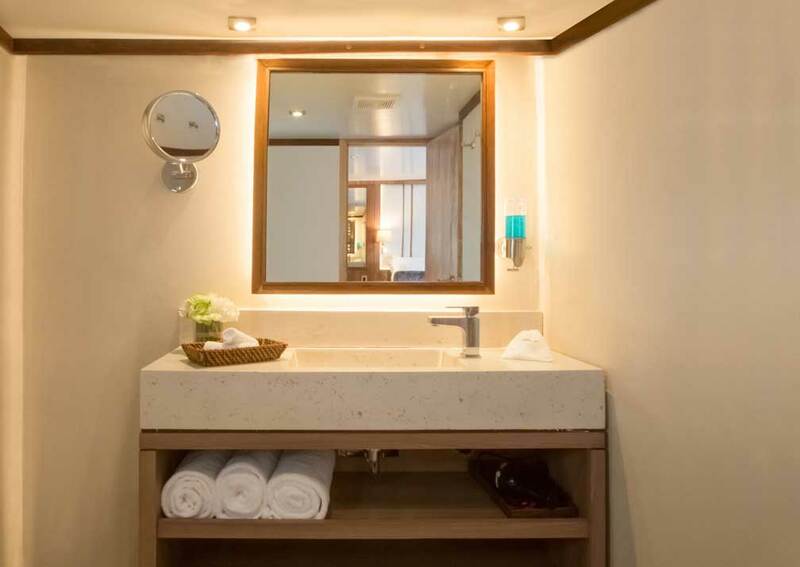 All suites and staterooms have individual air conditioning, private bathroom with shower, hand basin, vanity unit, toilet and toiletries. Hairdryers are available. 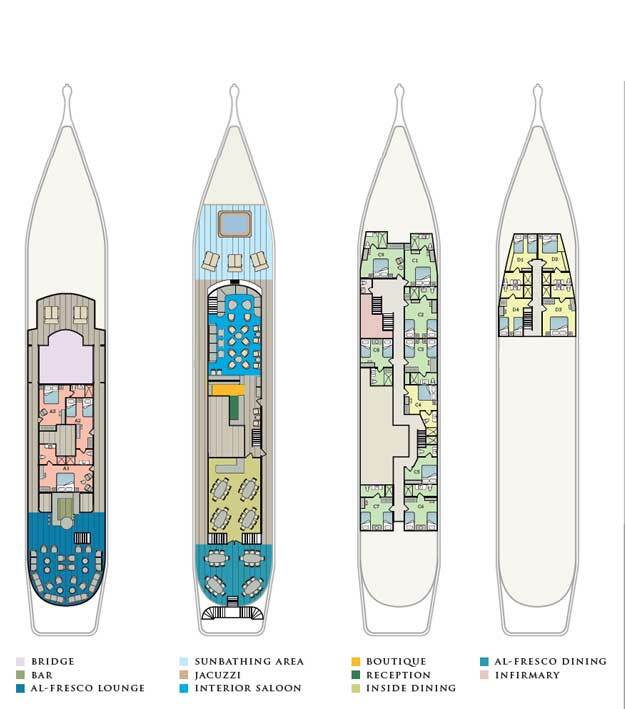 They have plenty of room for storing clothes and luggage, a safe and phone for on-board communication. 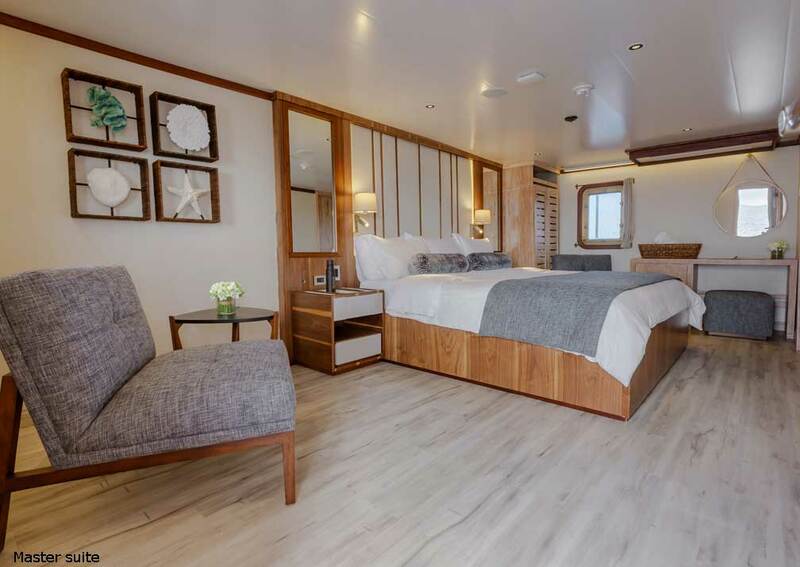 There are 9 premium staterooms on cormorant deck of which 4 (C1, C4, C5 and C9) each has a queen bed, and C2, C3, C6, C7 and C8 have 2 twin beds. C2 can also be configured as a queen bed. 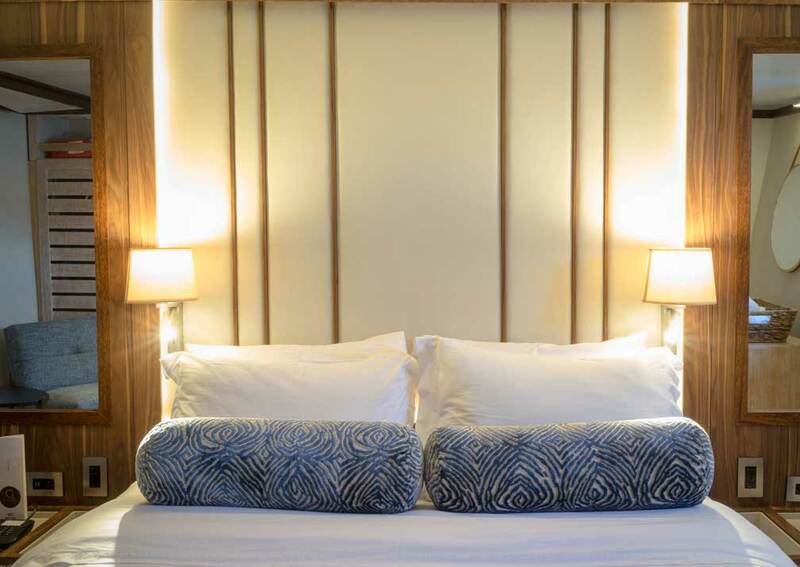 C1 is 18 sqm, C2 17 sqm, C3 17.5 sqm, C4 13 sqm, C5 13.5 sqm, C6 15.4 sqm, C7 17.5 sqm, C8 15 sqm and C9 18.4 sqm. 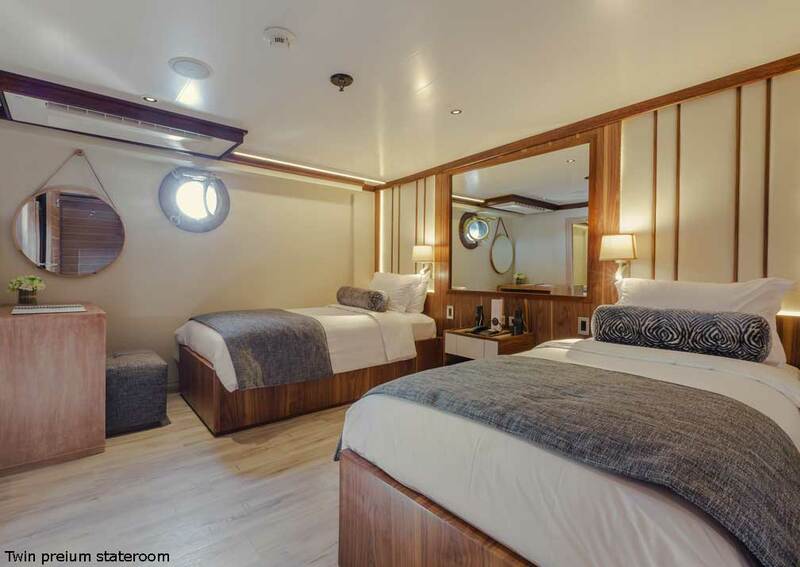 All these staterooms have portholes. 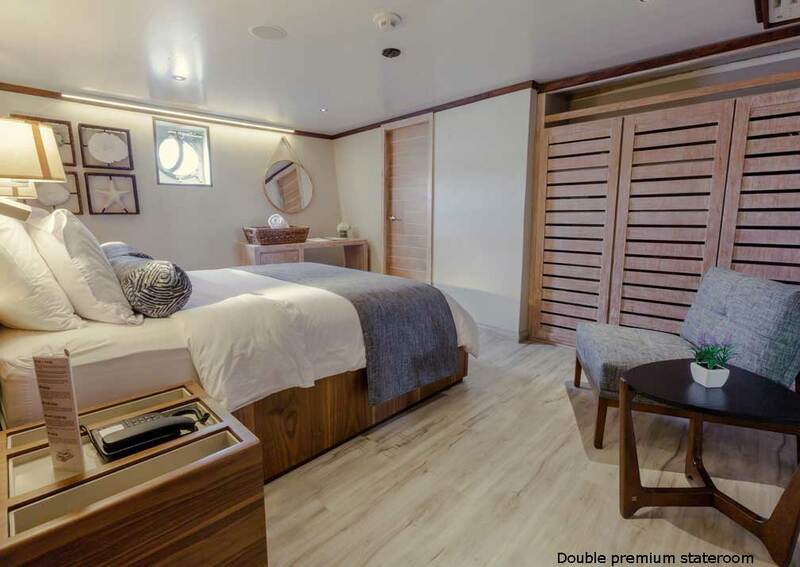 There are 4 deluxe staterooms on Darwin deck, comprising 2 queen bedded (D2 & D3) and 2 twin rooms (D1 & D4). D1, D2 and D3 are 16 sqm, and D4 is 19 sqm. All have a porthole. 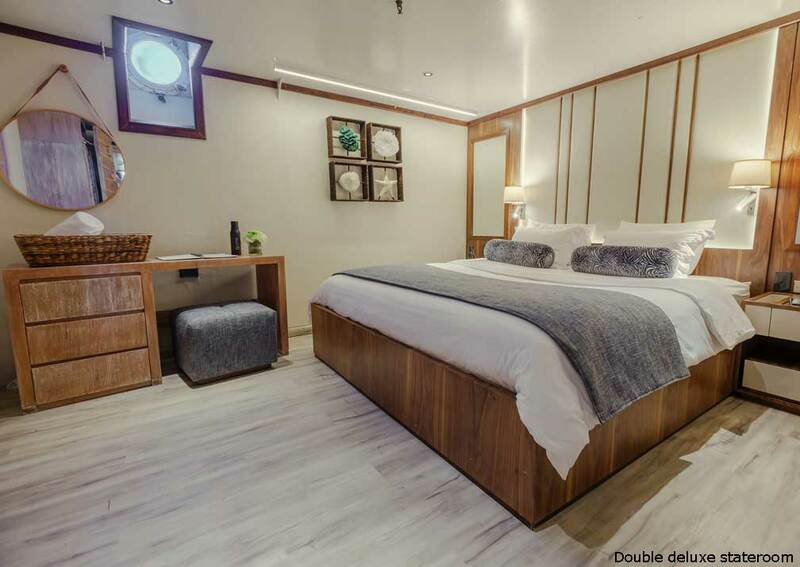 Accommodation: Bridge Deck: 3 junior suites; Main Deck: 9 cabins; Lower Deck: 4 cabins. 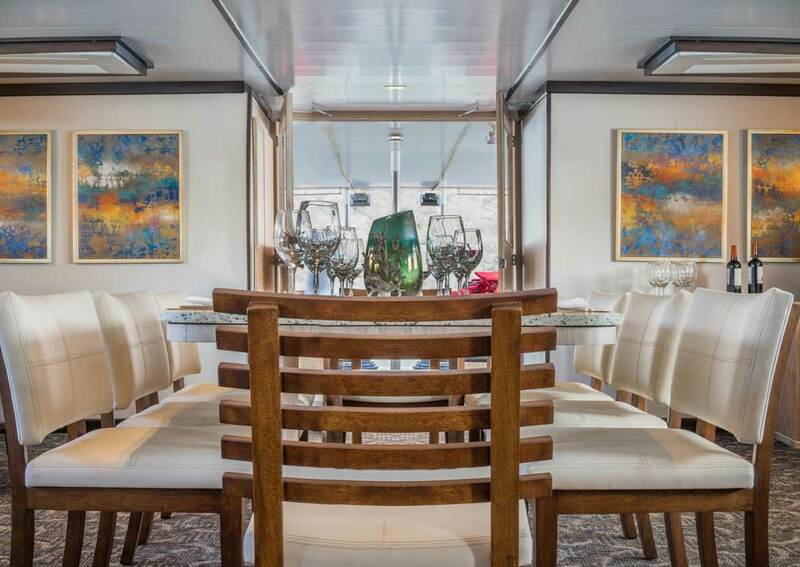 All have climate control and private bathrooms. 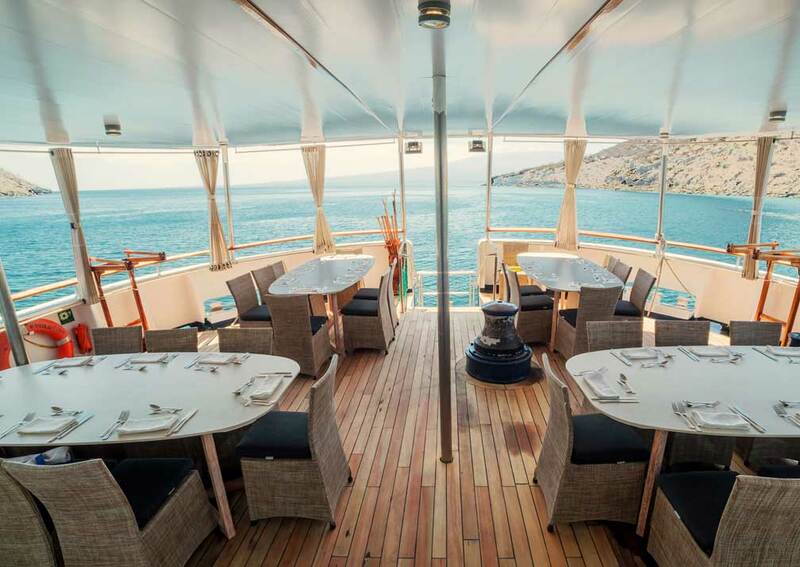 On Board: Dining room, outdoor dining area, lounge, bar and jacuzzi on Beagle Deck, outdoor lounge and bar and sun deck on Albatross Deck. 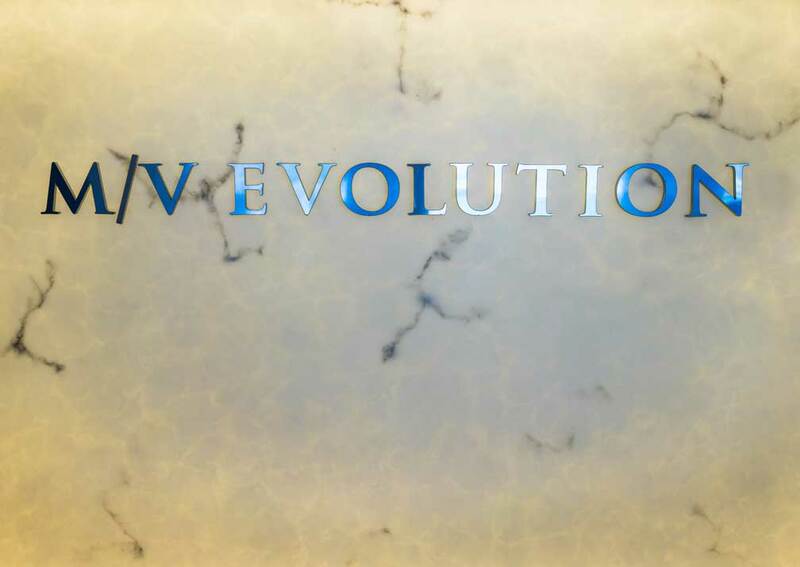 Evolution carries kayaks, snorkelling gear and wetsuits. Terms & Conditions: 15 yrs old and younger. 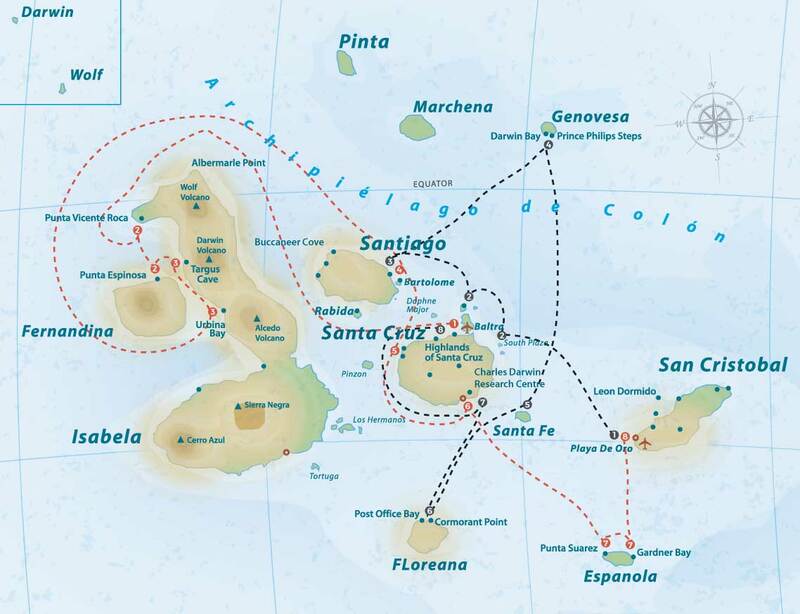 15% discount off normal cruise rates. Maximum of 3 children discounts per family (no exceptions). Based on 2 people sharing. Offers are for NEW bookings only, are subject to availability. 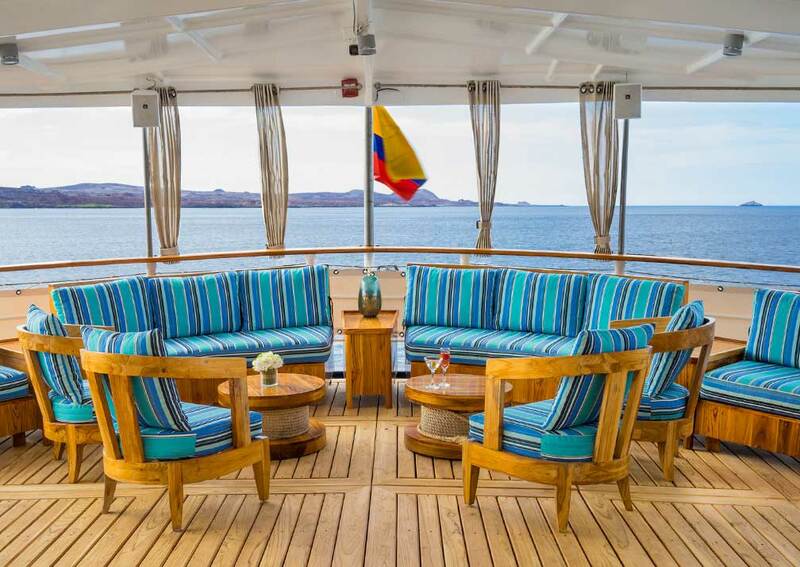 Combine two 7-night cruises and receive 10% discount on the 2nd week! Terms & Conditions: Based on 2 people sharing. Offers are for NEW bookings only, are subject to availability.